Athens, Ga. – Registration for VetCAMP 2014 opens Monday, Dec. 9, and runs through Wednesday, Feb. 5, officials at the University of Georgia College of Veterinary Medicine announced today. VetCAMP, or Veterinary Career Aptitude and Mentoring Program, is a seven-day program open to current high school sophomores, juniors and seniors who would like to experience veterinary medicine as a potential career path. 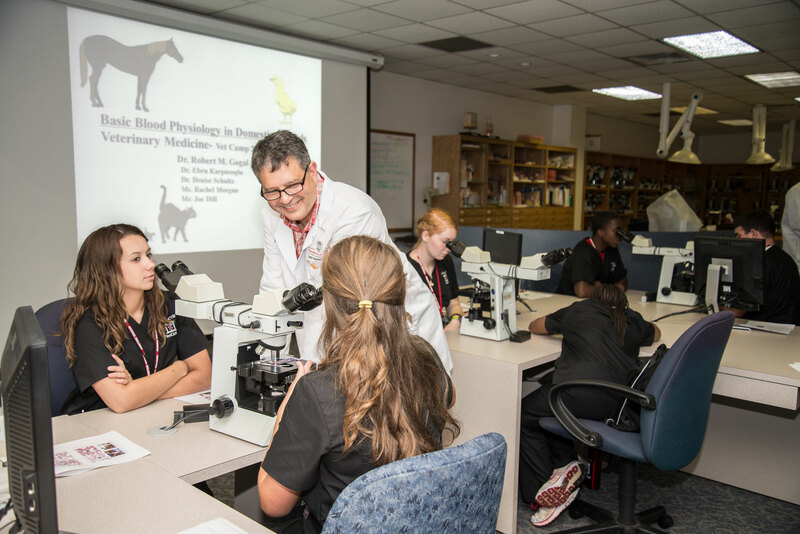 The on-site program offers participants opportunities for observation of and participation in the various services in the UGA Veterinary Teaching Hospital, the Poultry Diagnostic and Research Center and the College’s Veterinary Diagnostic Laboratories. The students will learn about: requirements for admission to the UGA College of Veterinary Medicine; research opportunities; study abroad opportunities; the college’s veterinary curriculum, as well as underserved specialties in the field of veterinary medicine. VetCAMP will be held Sunday, July 13 through Saturday, July 19. The students will be housed on the UGA campus. The $900 fee includes lodging, meals, instruction and social activities. Scholarships or financial assistance are available to students with demonstrated need. Students who wish to be considered for the program must complete a registration packet that includes a registration form, a teacher/counselor recommendation form, and an essay; an official high school transcript must also be submitted. The packet may be downloaded from the VetCAMP website at www.vet.uga.edu/GO/camp. For more information about the program, contact Lakecia Pettway at lpettway@uga.edu or 706/542-8411, or see the program’s website. The current UGA College of Veterinary Medicine Teaching Hospital, built in 1979, serves more than 22,500 patients per year in one of the smallest teaching hospitals in the United States. The college is currently building a new Veterinary Medical Learning Center, which will include a new teaching hospital as well as classrooms and laboratories that will allow for the education of more veterinarians.